07.00 – 12.00 Drive Almaty – Bas’shi village. 13.00 – 14.30 Drive from Bas’shi to the Singing Dune, with a short stop near Oshaktas place. Singing Dune is located in the valley of Ili River, about 2 kilometers from the river in its right bank, between small mountain ranges – the Greater and Lesser Kalkans. It looks like huge sand dune with overall height of 150m and length about 3 kilometers. The ridge of the unique sand dune is sharp as a blade. The sand crumbles underneath your feet, but the ridge does not get blunt. Two smaller sand dunes continue this one. The whole complex has an area of about 10 square kilometers. 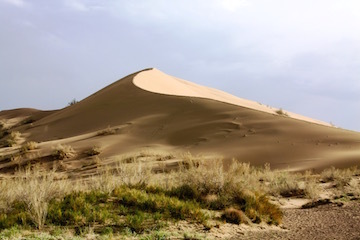 Other similar sand dunes in Kazakhstan can be found only in Mangistau region (eg.Sam sands), but the main difference of Semirechye dune (other name of Singing Dune) that in windy weather it is capable of making sound resembling low hum of jet aircraft. 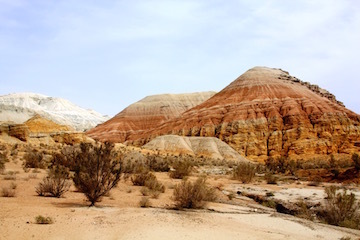 16.00 – 18.00 Drive from Singing Dune to Aktau mountains. Accommodation in tents at a foot of the hills. 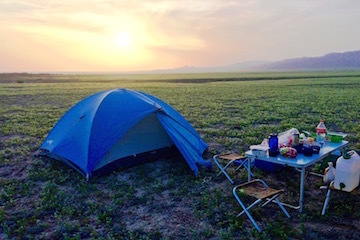 Overnight in tents (tent camping) in Aktau mountains. Early morning wake up to catch the fantastic sunrise in Aktau. 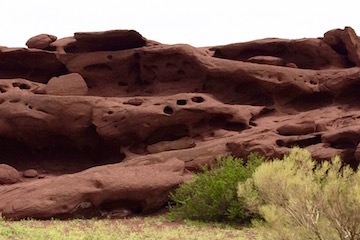 11.00 – 11.30 Drive from Aktau to Katutau volcanic mountains. 11.30 – 12.30 Excursions by Katitau formations. 12.30 – 13.00 Lunch in Katutau.